The Austin Air Pet Machine Filter has a true medical-grade HEPA (High Efficiency Particulate Arresting) filter surrounded by a special carbon/zeolite mixture which eliminates particulates and absorbs odors, smells, and gases. This carbon blend removes ammonia and the many irritants associated with indoor pets. 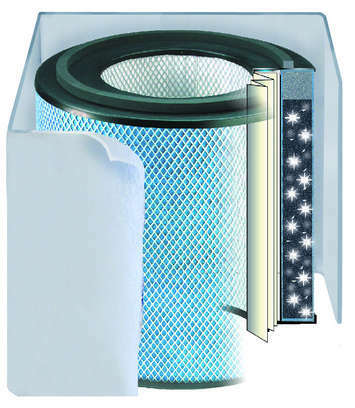 The HEPA filter removes 99.97 percent of all particles down to 0.3 microns in size. Please Note: If your unit was manufactured prior to August of 1995, this filter will not fit. You must contact customer service for assistance at 1-800-701-2513. As always, enjoy FREE SHIPPING to anywhere in the Continental U.S.!